Nanoscience can be a pretty unapproachable subject – proper science-y science that’s so tiny you can’t see it happening. Thankfully Josh Davies (MChem 2016) had the perfect visual to explain a key process. 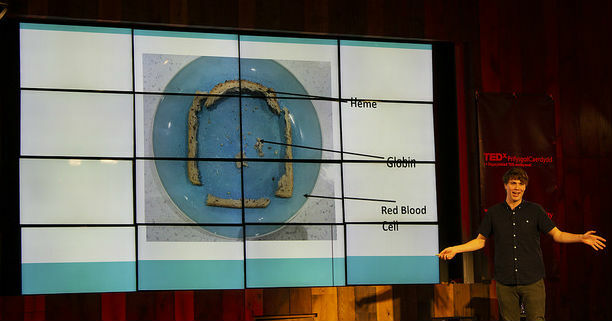 Imagine a blood cell is a piece of bread. The crust is the heme, the middle part the globin. Malaria doesn’t eat the crusts! By developing handheld detectors to identify blood cells with only the heme remaining, nanoscience is making diagnosis faster and more portable. One man quote machine Josh also provided our favourite piece of trivia of the day. The same process that turns the line pink on pregnancy tests is used in Roman glass chalice, The Lycurgus Cup. The nanoscience (it’s a gold particle mixed in the glass) is revealed when the cup is lit from behind, changing it from green to red. Gold nanoparticles have a huge range of colours, making them extremely useful for Magneto-Optical Diagnosis. Fiona Munnelly (BSc 2018) told us about the idea she developed with the group Periods in Poverty: donation points for sanitary products. In a moving talk she outlined the scale of the problem, emphasising that it affects the same groups as those hit hardest by welfare reforms and in-work poverty. 4 – The robots are coming, but you shouldn’t be afraid! 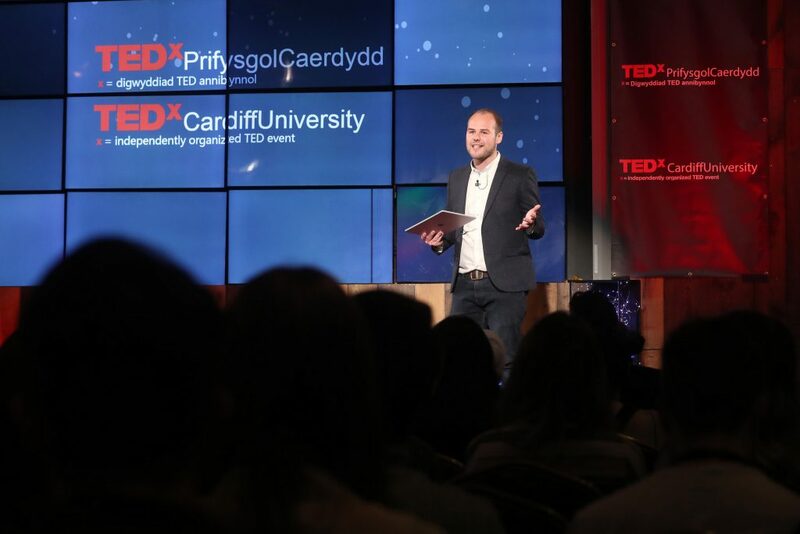 Guto Harri (PgDip 1988) gave an impassioned talk on the opportunities presented by artificial intelligence as it becomes an integral part of our working lives. Rather than something to fear, and with 66 million jobs at risk he understands the impulse, Guto thinks that automating the mundane tasks will allow our human, creative sides to flourish. Ben Channon (MArch 2012) believes that “we have a responsibility to create buildings that have a positive psychological reaction” on our mental health. He outlined the impact of our physical environment with the results from one Japanese study that found changing the colour of lighting in train stations to blue at night resulted in an 84% decrease in suicides. Dr Emma Yhnell (BSc 2012, PhD 2016) posed the question “who should know about your unique genetic information?” By talking about her own family members affected by brain disease, and the genetic risks of diseases like Alzheimer’s, Emma challenged the room to think about why, why not, who and how your genetic information should be shared and stored.